Life is funny sometimes. I went to college and received my degree in political science with concentrations in economics and international affairs and a Spanish minor. In my mind, I was convinced that I wanted to go into law or government. I actually thought that I wanted to become some sort of elected official. As my collegiate career went on, I began realizing that while I loved learning about the topic, I had no real desire to go into that field. And here I am two years later. Searching. Trying to find where I fit in this world. I have been working at Starbucks since I graduated. I have lived in New York City and worked at a creative agency. And here I am, back at Starbucks. I am almost 25-years old and I am not totally sure who I am. But does anyone my age? However, since I have started this blog, I am beginning to see what direction my life may take. Not to say that things can't change, but I am so happy writing. And cooking. Coming home from a long day at Starbucks, nothing makes me happier than working in the kitchen on a new recipe and then sitting down at my computer, listening to music, and writing. As I said a few posts ago, my family and I went to Green Lake in Wisconsin for the 4th of July. One of the biggest blessings of being back in Chicago (after living in New York for a year) has been having the ability to spend time with my family. Especially my two nieces - Linnea (who you have seen many times before) and Kira. The weather that we had over the 4th was gorgeous! HOT, but gorgeous! A few weeks ago I was complaining about how Hades had taken over the Chicagoland area. Well, you couldn't find me complaining over Independence Day. I wouldn't have changed a thing. Laying on the dock, soaking up the sun, drinking a Summer Shandy or Skip and Go Naked, and relaxing. Seriously, it was probably the best 4th of July that I have had in quite some time! I have been noticing that the recipes lately, especially La Noche de España, have been a little more complicated. So I think that this one is a nice little breather - something that is quick and easy. Perfect for those week nights where you don't have a lot of time to cook an extensive meal. Hoagies have been something that my family has eaten for as long as I can remember. For some old reason, I can remember being a kid and getting so excited when my mom made these sandwiches for dinner. I thought they were a treat! While they are nothing too special, they are delicious! 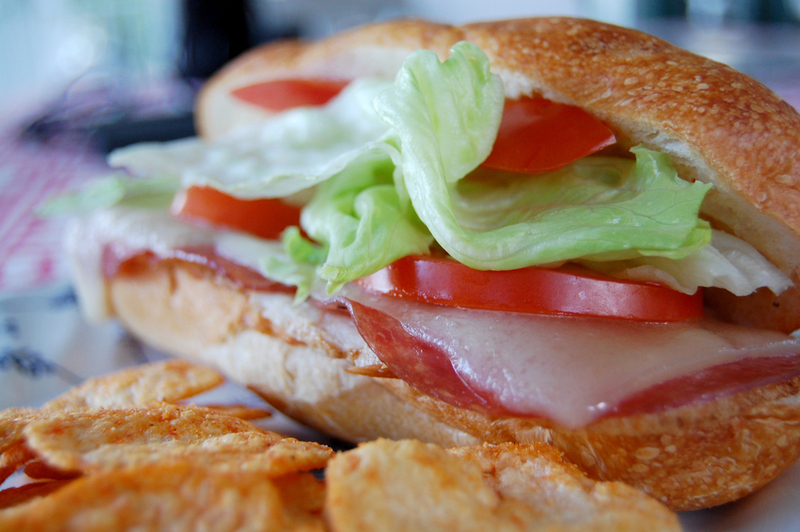 Hoagies - nothing too difficult or out of the ordinary. But a great summer meal. Slice sub rolls in half, lengthwise. Spread Italian dressing so it coats one half of the roll, close the roll so the dressing covers both sides. Layer the sandwich with turkey, salami, and Swiss cheese (in that order). Broil in the oven until cheese melts to your liking. Remove and top with lettuce and tomatoes. Enjoy!